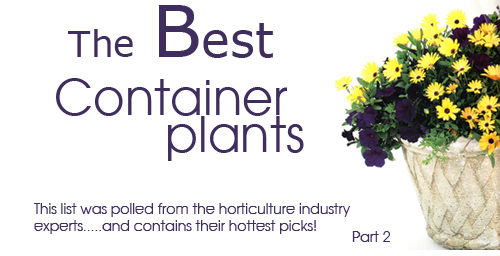 In this blog entry we continue with the theme of "the best container plants" by adding another 5 entries. Hope you enjoy these suggestions. Please let us know if you try any of these items. Thanks! 6. Phlox 'intensia Lilac Rose' can grow up to 12" tall and grows annually. It spreads vigorously so is a good choice for a pot or garden container. It's lightly fragrant flowers are lavender pink with a dark rose eye. 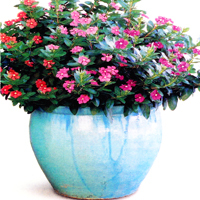 Blooming from spring to fall, these flowers are stunning is large containers and footed urns. Give it full sun, it tolerates heat and humidity along with cooler weather. 7. Mandevilla sanderi 'MonProud' (strawberry lemonade) This is a thirst quencher with bright colors and hot flowers. A tropical vine that grows to up 8 feet long, this is a great addition for the sides of large planters where you want the vine to drape over the sides. They should look like they are spilling out of the pot with colors of green, cream, pink and white. It provides year round color when kept as a shrub. Give it moist well draining soil. 8. Scaevola 'Whirlwind Blue' is a sturdy fan flower with dainty looks. A wonderful annual that grows up to 12 inches long and add bursts of color to any type of planter. it can tolerate partial shade and like fertile moist soil. We love the flat petals that look like little umbrellas. 9. Vinca 'Merry-Go-Round' is a cheerful plant with tremendous color. Growing up to 24" inches this can be used in very large planter pots. It is one of the tallest, hardiest, and cheeriest of the vincas. It's blooms in luminous red, purple, and liac will surely brighten a terrace planter. The jewel toned flowers spring from bushy, glossy dark leaves. Bring on the heat and sun and give it plenty of moist soil. 10. Oxalis tetraphylla 'Iron Cross' These shamrock shaped plants can stand alone or go lovely with a partner. Starting out as a bulb they grow to 9" tall and makes full compact clumps that look lovely alone in small pots. They also look great with added to larger color displays in bigger planters. Plant them in partial sun with well draining soil and these are sure to please. Children think they are fun because of the Iron Cross shape with leaves supporting four lobes. Well we hope you enjoyed this 2 part series on great plants for all kinds of containers. If you try any of them, please let us know. We love to hear all feedback you care to provide. Thanks! Read more....New Tips for container gardening. Read more....Planting a "cool" garden pot.